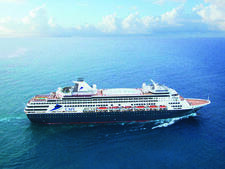 Traditional British cruise line Cruise & Maritime Voyages took delivery of its new flagship, the adults-only Columbus, in spring 2017, following an extensive refit that adapted the 63,768-tonne vessel to suit the tastes of the mature Brits that make up the bulk of CMV's market. The ship has a long and interesting history. 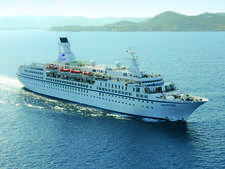 Built in 1987, it's had various incarnations including Star Princess, the old Arcadia for P&O Cruises, then Ocean Village, and then, most recently, Pacific Pearl, sailing for P&O Australia. The biggest change since the CMV acquisition is the conversion of all the former children's clubs into entertainment spaces, as well as the refurbishment of some of the public areas with smart new carpets and decor. Being an older ship, Columbus has generous public spaces and very good passenger flow. Having three stairwells and three sets of lifts on a ship that's mid-sized in today's terms is a luxury (many newer vessels only have two) and make it much easier to get around. Another bonus of being an older ship is the extensive outdoor space, which includes generously-sized open decks with some solid teak-effect decking, and a wide promenade outside on deck 7. Although this doesn't wrap around the ship in the traditional style, it's a lovely place to sit and take the sea air. What's impressive -- and more in line with what you'd expect of more expensive mid-sized ships -- is the variety of dining venues, not least two outstanding speciality restaurants, The Grill and Fusion. And partnerships with quality suppliers of meat, ice cream, tea and coffee really raise the standard of the cuisine. Overall, Columbus has a warm, friendly feel. The newly decorated atrium certainly makes a statement, with a bright purple patterned carpet and a grand piano as a centrepiece, but all the lounges and restaurants are somehow familiar and comforting, rather than garishly themed. You won't find gimmicks here. The emphasis is on friendly service and realistic pricing, from the shore excursions to the spa treatments and bar prices. Columbus is not a luxury cruise ship and isn't represented as one. It certainly has its flaws -- the evening shows were pretty hit-and-miss, there aren't many balcony cabins, and parts of the ship look a bit dated. Some of the lounges are hidden away so people don't find them and, as a result, lack atmosphere. But the value for money is exceptional, especially if you snag one of the buy-one-get-one-free offers for the world voyage. The happy-to-help crew, quality food and sensible bar prices count for a lot, and this ship should serve its market well. The majority of passengers on a regular Columbus cruise are Brits over 60 -- CMV makes it clear in its marketing messages that this is a traditional product, and this demographic are attracted to that. 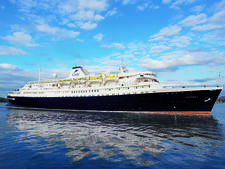 Mini cruises from the ship's home port of Tilbury, meanwhile, attract a much younger audience and a lot of first-timers, seduced by very reasonable offers. 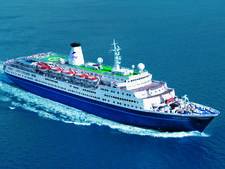 Notably, Columbus is a very singles-friendly ship, with 150 cabins on every cruise offered to solo travellers. Single occupancy savings of up to 50 percent on the equivalent category full fares and a special singles' programme of events make it even more likely that you'll find plenty of solo passengers onboard. On longer cruises, like the world voyage, there may be as many pairs of friends as there are couples, as some very attractive BOGOF deals can be found. Although usually 'adults-only', Columbus offers a few multigenerational cruises during the school summer holidays, which means there could be a couple of hundred children onboard -- a warning for anybody who isn't keen on kids. Families considering this option should note that there are no specific children's facilities, save a few informal activities that the ship puts on for younger passengers. The bulk of passengers are from the UK, but as CMV has offices in the USA and Australia, there may be a small percentage from each onboard. 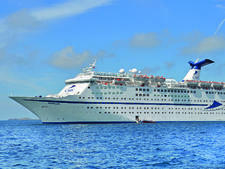 On world cruises that visit Australia that can go up to as much as 20 percent, as a lot of Australians board for a section of the voyage. Columbus has three dress codes: Casual (but no shorts or vests in the evening); informal (dressier but no need for men to wear ties); and formal (cocktail or evening dress, ties for men), with up to two formal nights on a week's cruise. These were interpreted loosely on my short cruise, perhaps because there were a lot of first timers onboard who weren't aware. Evening outfits varied from jeans to full black tie and, for women, sparkly dresses (although not long gowns). Most people in the main restaurant were smartly dressed, while the dressed-down opted for the buffet. 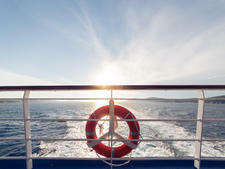 Gratuity is &pound;7 per person per day on short cruises or &pound;6 on longer cruises of more than 16 nights. Tips are added automatically to onboard accounts. No other tips are charged or expected. The onboard currency is pounds sterling.